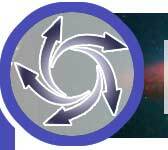 I have copied all the transhumanism pages to my new transhumanism Web site, ThinkBeyond.us. New articles related to skepticism, transhumanism, and rationality will appear there. One of the greatest threats I see today facing the industrialized world in general, and the United States in particular, is credulity--the willingness to believe, on slight or no evidence, the most outrageous of things. Scepticism and intellectual rigor are greeted with hostility; science is under seige in classrooms and in popular culture; in matters of public policy debate, superstition and unreason are given more weight than science. In fact, "science" is becoming something of a dirty word. In his book The Demon-Haunted World, Carl Sagan writes, "The siren song of unreason is not just a cultural wrong but a dangerous plunge into darkness that threatens our most basic freedoms." The book was published in 1988, when trickle-down economics and alien abductions were all the rage, and it is hard to imagine anything more appropriate today. The last six years or so have proven Sagan right in a way I doubt even he could have imagined. In 2006, nearly twenty years after those words were penned, we have an American President who is a fundamentalist Christian and who seems to believe that science and highfalutin book-larnin' never did nobody a lick of good; anti-intellectualism is rampant in American society and politics; and people are actually arguing about "Intelligent Design"--Intelligent Design, fer Chrissakes!--as if it were something for real that should, y'know, be taught in schools. And frankly, it all well and truly pisses me off. I get frustrated whenever I see credulous, anti-intellectual claptrap spewing out of some hole somewhere. And, to be quite blunt, it's everywhere. It's as if somebody plugged all the sewers in New York City, and all this brown stuff is bubbling up out of the manhole covers and flooding the streets, and nobody notices. Hell, people seem to like it. And it pisses me off. It pisses me off because these people should know better. It pisses me off because gullibility and credulity are corrosive to society. It pisses me off because it undermines the foundation upon which this country rests. The United States today dominates the world politically, socially, and economically largely on the strength of our belief that the world is knowable and comprehensible, and that the pursuit of reason is a valuable undertaking. That dominance is threatened whenever people turn their backs on reason in facor of pseudoscience and superstition. China and other economic and political competitors are more than happy to see us turn away from the very things upon which we built our advantage; they do not need to challenge us for world leadershp if we're happy to abdicate. As other nations quietly build a technological and scientific advantage--China today graduates more than seven times as many engineering and science graduates as the United States does every year, and cutting-edge research in biomedicine and molecular biology is more likely to occur today in Korea than in the United States--we retreat farther and farther into dogma and irrationality. It pisses me off because reason is the greatest single gift that humankind has, the thing that sets us apart from all the rest of nature, and to squander that gift--to fritter away our reason, to exchange knowledge and understanding for faeries and pixie dust--is a travesty beyond imagining. Faeries and pixie dust are remarkably seductive. In the book Why People Believe Weird Things: Pseudoscience, Superstition, and Other Confusions of Our Time, author Michael Shermer says there are five reasons why people turn away from reason for faeries and pixie dust: to console themselves against loss and fear; to get instant gratification; because the real world is too complicated; because they want to draw simple moral lessons from their experiences; and because they just plain WANT to believe. I would add a sixth: because people are really, really lazy. Reason is a tool. It is a tool whose task is to understand the workings of the physical world. And it does that job far, far better than every other tool that has ever been tried. It is no accident that every time some religious faith has tried to contradict science--every time, without exception--on some matter of empirical fact, the religious faith has been wrong. Every goddamn time. But this tool has a price. You have to work to master it. Like all tools, it must be learned. An excellent example of the way people abandon reason can be found in the current crusade against vaccination that's becoming trendy in the US today. Now, I have no particular emotional investment in vaccination per se; I was vaccinated as a kid, back when I was still afraid of needles, and I am immune to pediatric diseases. If someone infected with polio or measles or some such thing gets in my face, it doesn't mean anything to me; I'm not going to get sick. But what does raise my ire is people who do not have the faintest idea how the human body works, who do not understand the first thing about immunity or medicine, who can not seem to muster the resources to use Google, quoting wildly innacurate and in many cases demonstrably, provably wrong nonsense about how vaccination does not work and (in the most extreme cases) is a sinister Government plot to kill children, without doing even the bare minimum of fact-checking. It came to a head when someone in recently told me that there is no way to know whether or not vaccination works. There is no way to know if a vaccination works. It is a Mystery, beyond the realm of human knowledge. We can never hope to understand the truth; the reality of how disease works, of how the human body works, is beyond our grasp, forever shrouded in night. I think this mindset is absolutely, utterly fascinating. To me, this speaks of a person who lives in a world controlled by vague, incomprehensible forces forever beyond human knowledge, a demon-haunted world where things just sort of happen and we can never really know how or why. Viruses and bacteria, faeries and pixie dust; it makes no difference in the end, because they're all just "theories," and one theory is as good as another. When the scientist speaks of a "theory," he is not talking about something that he guesses is true. To a scientist, the word "theory" means something like "model"--it's a conceptual framework, supported by evidence, that explains the way something works. Gravity is a "theory," yet the evidence for it is pretty conclusive. One of the cornerstones of the anti-vaccination fad is the idea that bacteria and viruses do not cause disease. The anti-vaccination crowd believes that there is no way to know how disease works; and their "theory," which is that viruses and bacteria do not cause disease, is just as valid as the theory that they do. The truth is, we can know whether or not a vaccination works. We can know what causes disease. We can know how our bodies work. There is no magic in it; it is the basic operation of immutable natural law, machinery operating on a scale of complexity that is very high and a scale of size that is very tiny, but machinery nonetheless. One might just as well say we can never really know how a wristwatch operates. Actually, we can. Take the back off and have a look; this lever pushes on this gear, which moves and rotates this gear, simple parts operating in simple and comprehensible ways, making up a whole that is just as comprehensible. When I was majoring in neurophysiology, back in my ill-spent college days, I was amazed at how mechanical it all was. The machinery of life is vastly complex, and composed of a mind-boggling array of parts which work together in profoundly intricate and subtle ways...but ultimately, each part is very simple, and the way each part operates is very simple. This protein fits into that protein, and bends it just so, and it latches onto this ion channel, which opens, and releases its contents...a complicated system, but complicated only by its number of parts, and each operating in ways that are simple and knowable. There is no Grand Mystery to the operation of antibodies, no dim and incomprehensible, shadowy miracle behind the workings of a T cell. The human body is not completely understood, but that does not mean there are not things which we do know. People like to believe that science destroys spirituality, that science robs the world of color, that faeries and pixie dust are what makes life worth living. Albert Einstein himself is famous for saying "imagination is more important than knowledge." But the kind of imagination is important. Einstein's imagination let him see into the mysteries of the physical world, let him conceive of a world in which time does not move at the same rate for everyone, in which matter and energy are two different forms of exactly the same thing. What gave his imagination value is the fact that, when he imagined these things, he then set about testing them, probing them, seeing if they were true. We know that general and special relativity have meaning because we can test them, because they hold up when we poke them. Imagination to Einstein was what let him make the world comprehensible, what brought it into focus, not what made it dim and mysterious and unknowable. We can know that time does not pass at the same rate for everyone; in fact, it's an inconvenient reality for the people who designed the Global Positioning System, because time does not pass for the satellites that make it work the same way as it does for us on the surface, and they have to account for that in the system. We can know that subatomic particles are indeterminate and maddeningly fuzzy, and can exist in different places at the same time and zap from place to place without crossing the space in between; in fact, this makes life very inconvenient for the people who designed the processor chip inside the computer you are using to read this right now, because it imposes limits on how small the circuits in that chip can be, and how closely together those circuits can be packed. We can know these things. Ironically, Einstein's imagination failed him. The man who spoke of the importance of imagination lived the last fifteen years of his life as a monument to himself, achieving nothing new, because his imagination would not let him see the value of quantum theory. His religious belief stopped him from accepting the truth of the world. Every time religion disagrees with science on matters of empirical fact, religion is wrong. Every time. Einstein believed that God would never leave anything to chance. He believed that God would not make a universe in which uncertainty played a part. Because of that religious belief, he rejected quantum mechanics. He could not imagine that such a weird and nonintuitive thing could underlay the universe; could not imagine that God would do that. Hell, the laser in your DVD player works on quantum principles. It is a "quantum well" device, a crystalline lattice that traps electrons in a bizarre zero-dimensional state, forcing them to yeild up photons of light in precisely thus-and-such a frequency, precisely in lockstep. People live in a demon-haunted world, whose fundamental forces are shrouded in shadow...we cannot know, we cannot know. The real knowledge is complicated, and takes work to understand; to understand physics, you have to work at it, and to understand the human immune system, you have to work at it. How much easier and how much more satisfying to those who want the quick answers to imagine that you just have to chant the right words or, I don't know, wave a magic crystal over your head or something, and you'll be cured of disease. How much less satisfying to know that all people are slightly different from one another, sometimes in subtle ways, and that this difference leads to subtle differences in the way the body responds to drugs or vaccinations, and sometimes they don't work in some people the same way they do in others. Why worry about all that, when all you really have to do is wave a magic crystal over your head? And people find this misty, demon-haunted world comforting. If they do not know something, they find comfort in the notion that it cannot be known. Why deal with complexities and uncertainties when you can throw up your hands, abdicate reason, and say We Cannot Know? And besides, science takes away magic, right? Science takes away wonder, right? There is delight in faeries and pixie dust, right? Science replaces imagination and joy and wonder with cold, sterile, boring fact, leaving no room for the human spirit, right? If only they knew. Not only does science fill the world with wonder, it is all the more wonderous and incredible precisely because it is real. And it is far more wonderous and far more amazing than the puny human imagination can dream. We used to imagine ourselves in the center of the universe, the stars overhead the light of Heaven streaming through thousands of tiny pinpricks in the dome of the sky. Today, we know that our universe is more vast and more broad in its scope and sweep and more amazing and more varied than any human being can ever imagine. 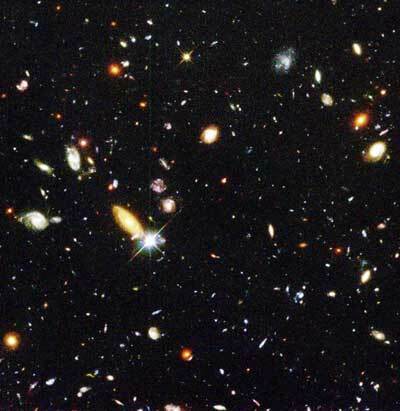 There is a photograph, taken by Hubble's deep-field telescopes, that shows thousands and thousands and thousands of galaxies, each containing hundreds of millions or billions of stars..and that photograph represents one twentieth of one degree of arc--a sliver of sky so tiny it's about the size of a dime held seventy-five feet away. With the exception of the bright white object with diffraction lines radiating from it to the lower left of center (which is a star here in our own Milky Way galaxy), every single thing you see here is a galaxy. An entire galaxy, each with tens of millions or billions of stars. This is not a remarkable section of sky. It looks like this no matter where you point the Deep Field Telescope. Every one of the things in this picture. Every dot, every fleck of light. An entire galaxy. It's that way everywhere, no matter where you look--wonders upon wonders upon wonders, until it exceeds our ability to count. Galaxies in collision, releasing more energy than our sun will release in ten thousand of its lifetimes; globular clusters blazing with the light of newborn suns; all this incredible majesty and wonder, and all our ancestors could come up with is a really big sphere with a bunch of holes in it. Human imagination always looks feeble and pathetic compared to reality. What are leprechauns and pixies and gnomes but little versions of us? We can't even imagine anything different in any meaningful way from ourselves! The best we can do in this modern age for monsters is Bigfoot...a big hairy ape living in Ohio? The deep-sea geothermal vents are home to entire ecosystems richer and weirder and more varied than anything we imagined, who have metabolisms unlike anything we've ever known...but the best we can come up with when we think of strange creatures is a big hairy ape, just like the apes we see in the zoo only larger? The virus I mentioned in the essay at the front of this section--the one that can infect a dead cyanobacterium and bring it back to life--is far more amazing and wonderful than anything the mismash of pseudoscience and superstition that barrages us every day can possibly dream up. Think about what it means; on a cellular level, death itself isn't necessarily permanent. And people think that science drains the wonder and spirituality out of the universe. Ha! I'll take the real mysteries--mysteries not only stranger than we imagine, but stranger than we can imagine-- over some short tart with wings. Pixie dust? Nowhere near as magical as a humble virus. But the people in the anti-vaccination community turn their backs even on viruses, making the rather ludicrous claim that bacteria and viruses do not cause disease. 'Cause, really, how can we even know? The TV show "The X Files" had a motto: "I want to believe." That motto is the creed for those who abandon reason for flim-flam and make-believe. Groom Lake, Nevada, houses a secret Air Force base, a base referred to as "Area 51," where Lockheed and other defense contractors test-fly new prototypes of supersecret combat aircraft. Up in the sky above Groom Lake, I see something I do not recognize. It must be...space aliens!!!!!!! I believe that the world is a knowable and comprehensible place. I do not believe in a demon-haunted world; I believe in a world that operates according to principles that are the same everywhere. I believe that we do not know everything about this world, or indeed even most things about this world...but there are some things we do know. I believe the tools that let us sort truth from bunk are learned tools--tools which, sadly, many people choose not to master. Indeed, some people choose to vilify those who master them, preferring make-believe and comfortable illusions over reason and knowledge, preferring a world where we simply can not know over a world where knowledge takes hard work. Carl Sagan wrote, "It is far better to grasp the Universe as it really is than to persist in delusion, however satisfying and reassuring." Sadly, that seems to be a minority opinion.